If your company or organization has a gathering coming up on the horizon, then you need to think about how you’re going to promote your big event to the public at large. It can certainly seem overwhelming, but you’ll feel better once you start making a plan of action. Of course, we’re happy to help you in all facets of your campaign, from putting together a media plan to doing the actual production of your event. In the meantime, we’ve put together ten fun ideas that will help you promote your function: 1. Invest in Paid Media At HS, we can set you up with a media plan that will expose your event to a new audience while still working in tandem with your overall branding strategy. Paid media is a great way to get the ball rolling as you begin your promotional efforts – tools like Google AdWords, different types of search and display advertising, SEO (Search Engine Optimization) and PPC (Pay-Per-Click) campaigns are the types of efforts that can drive “earned” (coverage you don’t have to pay for) media. Another effective tool to get your event some earned media is the creation of a press release. Your press release should be written to give your local media the highlights of your event and why it’s worthwhile for them to cover it. You need to make sure you’re featuring your most compelling aspects of the event right at the beginning of your press release. Put yourselves in the shoes of an editor or publisher that’s receiving it – what would make you want to put this story on the news? You should follow-up with phone calls after a couple days – you’ll definitely need to sell yourself to the station, don’t expect anyone to cover your event. You need to make it clear why the story matters to the community and the station’s audience. 2. Share on Social Media Obviously, social media should play a huge role in any of your marketing efforts. Promoting your event through the popular social media channels – LinkedIn, Twitter and Facebook – are great ways to reach potential attendees for your event. Social media is an especially effective way to spark a conversation with your audience, and hopefully that will lead to them sharing the information about your event with their own followers. You can also create a custom hashtag for your event and encourage your followers to tag any messages that relate to your event. Be sure to utilize some of the newer features these networks have to offer. Have you considered doing a Facebook Live session to answer questions about and promote your event? 3. Create Branded Wearables People absolutely love free stuff. Creating branded wearables – t-shirts, tank tops, hats and the like – is a great way to get people to promote your event for you. Consider having these items made up in the weeks before your event so that word can spread as you distribute them for free. Be sure to put all relevant information about your event on the wearable – the date, time, location and website. Everyone on your team should have these items available to distribute to family and friends, and of course, to wear themselves. 4. Give Away Free Tickets One way to generate interest on your social media pages is to do ticket giveaways. As we’ve already stated, people love free stuff. The great thing about free ticket giveaways through your social media is that the recipient can – and most likely will – instantly post about their excitement at receiving the tickets, which will then include their followers in your promotional matrix. People get interested in something when they hear their friend got something free from it. It also gives you content for your social media pages – just don’t forget to use your hashtag! 5. Consider a Street Team To really promote your event at a grassroots level, you may want to consider using a street team. You can either gather a group of your own employees or volunteers to do this, or for a relatively low hourly wage you can hire a group of people to hit the streets to hand out flyers or free branded wearables, or both, and also leave promotional cards at area establishments. Before getting your street team together, make sure you’re maximizing their time by having a route planned out, and a list of areas and establishments that are relevant to the target market you’re looking to hit for your event. Also, make sure you have their t-shirt sizes so they can be in your branded clothing while they’re out doing promotion on the street for you. 6. Record Some Podcasts Is there a local podcast that’s relevant to your event? Make an overture to the hosts or producer to see if you – or one of your speakers – can get on as a guest to promote your event. Obviously, it’s great to get any media attention you can, so of course you want to try for your local morning shows, radio and any public tv show that may be appropriate. But if your gathering is more of a niche type of event, scour the web for a podcast that speaks to your audience. You may also want to consider recording one on your own about the event. It adds some color to your website, and gives you as much time as you need to interview guests or talk about different aspects of your event. It can also be done relatively inexpensively, and with little technical knowledge. 7. Submit to Local Event Calendars/Listings You’ll definitely want to get your event information to any local event calendars and listings. Start with your local paper, but don’t forget to check out any alternative weeklies, or supermarket and coffee shop bulletin boards around town. Ask your team if they know of any good one’s, and be sure to look on-line for community event calendars. Submit your pertinent info to all of them as far out as you can. 8. Write Blog Posts You should be blogging about your event and the preparations for it on your own site in the weeks leading up to it. People enjoy participating in a buildup to a big event, so make sure you get good pictures of the different elements of the setup, and feel free to feature members of your team as they prepare – you can do Q&A sessions, quick videos – anything to keep people interested is a good idea to post to your blog. It also helps for Search Engine Optimization (SEO) results – the more you blog about your event, the more likely it is to rank higher in a Google search, which will help you on the promotional side. 9. Contact Industry Influencers Are there any prominent writers/speakers/bloggers who are in the same field as your event that you could invite to participate, or at least have them review your event? These experts in your field who already have their own following are called ‘influencers’ and this type of marketing is becoming more prevalent by the day. The hope is that they take an interest in your event and then start spreading it to their own group of followers. This may be something to consider when putting together a budget, as it might take more than a free t-shirt to get these types of people interested in what your event has to say. 10. Get Sponsorships Have you contacted the local business and philanthropic community about sponsoring your event? You can make the case to them that sponsoring your event isn’t just good marketing for you, it’s good marketing for them. Make clear the positive associations being associated with your event can bring them. A lot of organizations understandably are wondering what’s in it for them – highlight any positive PR that may benefit their company. If your event has sponsors or vendors, ask them to promote the event on their social media as well. 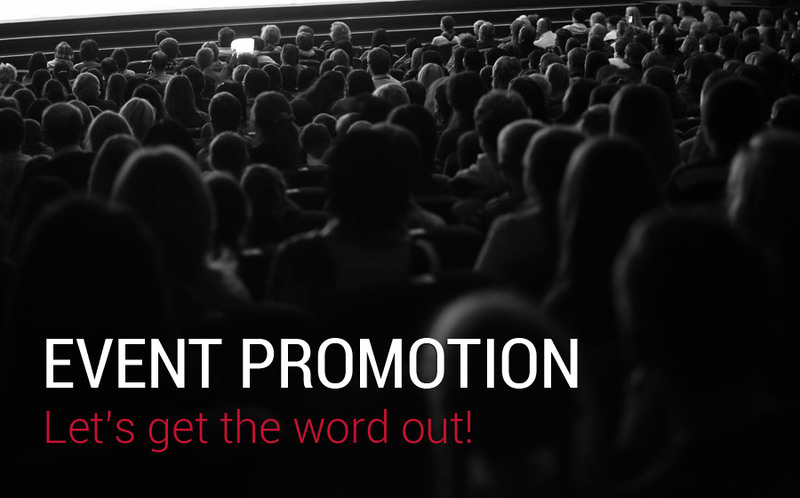 It would even be beneficial to provide them with images and content – you want to make it easy for them to promote your event. When applicable, tag them in posts to help generate more organic impressions from their followers. If you need any more ideas or assistance, reach out to HS and we’ll be happy to help make sure your event goes off perfectly!